Improve Your site or YouTube video rankings and push up above Your competition with this affordable 5000+ authority links mix of high Moz Domain Authority 30+, Moz Page Authority 20+, dofollow and edu/gov links package! this authority links mix seo service is for You! Only in my custom lists Moz Domain Authority can reach up to 90+, who else can offer such service for only 5$? Proven by repeating orders from YouTube marketers this gig is excellent choice for video ranking. I can do up to 25 urls (power up tiers and inner pages for even better results) and up to 50 anchor texts (keywords) per url in one order. You receive VERIFIED = LIVE backlinks report in Excel sheet. I always over deliver and scrape new URLs on regular basis, for all my gigs I use only my own unique lists, NO purchased/public lists! 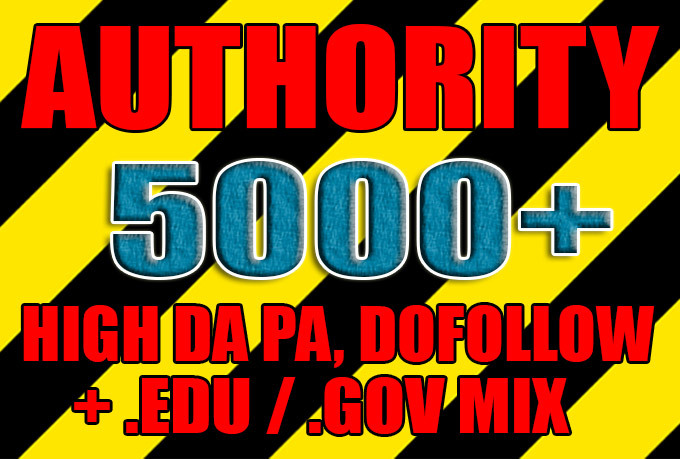 Get over 5000 high da pa, dofollow, edu and gov backlinks is ranked 5 out of 5. Based on 280 user reviews.